We were all grief-stricken at the sight of a drowned little boy on a beach in Syria a few short months ago. Unlike nothing else, this image pierced our hearts and galvanized us to take action to help refugees halfway across the world to find a safe home. Often, our faith and our political systems seem at odds – we see a need in our world that we know our Christian faith calls us to address, but our governments have other priorities. Feeding the hungry, clothing the naked, visiting the sick – those all sound like good things to do, but how can individual actions possibly make a difference? I believe they make a difference by changing one heart at a time. The caring spreads through our homes, our workplaces, our communities, our nation, our world. And when that happens, governments notice. When people decide that enough is enough, something shifts. Our small actions pile up and governments find ways to open doors, cut through red tape, engage citizens. The key is to get involved: write letters, share articles on social media, pray, offer your time, donate money and goods, and talk it up at home, at church, at school, at work. As the president of the Canadian Conference of Catholic Bishops wrote in September in a letter on the refugee crisis, “Any response to a major emergency situation is always most effective when governments, local communities and committed citizens work together.” When our brothers and sisters are suffering, faith meets politics and makes a difference. 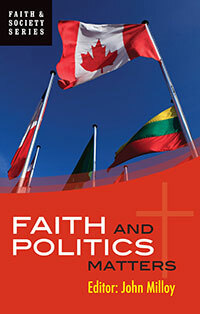 Join us tonight for the launch of Faith and Politics Matters at Regis College. The event will be held 6:00 – 8:00. Come meet editor John Milloy and his fellow contributors at this free event.